When it comes to achieving more in business, I’m a firm believer that we should all be aiming to work smarter, not harder. Being busy isn’t an admirable status anymore, especially amongst those people (like you and I) who are self-employed because we’re looking for a better work/life balance. 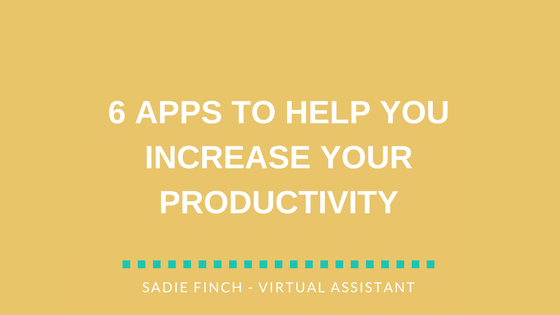 To help you achieve that goal, I’m sharing 6 amazing apps that have helped me increase productivity, streamline my processes and save time. And the best bit? There’s little to no cost involved! Asana is a free project management tool that lets you track your work (and your team’s) and manage your projects all in one place. I use Asana to work with clients and suppliers and I also manage my own projects and tasks there. It’s become my central hub; my go-to place for keeping track of everything that’s going on within my business. I’ve been able to increase productivity just through working in a more organised and structured way, and that’s a lesson I regularly share with my clients. You can use Asana to break down your work into tasks and subtasks, and then either distribute them amongst your team or organise them in terms of priority. Set due dates, add attachments and easily keep track of related conversations, comments and ideas. My favourite thing about Asana (other than it being free) is that it’s so easy to use. It’s a simple, intuitive system that anyone can easily pick up. Price: Start free with plenty of features. Upgrade to $9.99 per member, per month as your business grows. Toggl is a time tracking app that will monitor and record the amount of time you spend working on a particular project. It’s ideal for freelancers and independent consultants who charge by the hour. I use it myself to keep track of the time I spend on client work. The timesheet is so easy to download and understand; I share mine with clients as evidence of the hours I’m billing them for. (In fact, the timesheet from Toggl was one of the things video producer Steve Folland loved about my virtual assistant services). An additional benefit of using a time tracking app like Toggl is that it can actually help you to increase productivity. With the reports that Toggl generates, you can analyse where your time is going. When you can see how much time is being sucked up by those tasks that aren’t making you any money, it’ll force you to re-assess how you’re handling your workload. Price: Start free with more than enough features for most freelancers/small businesses. Upgrade to $9 per user/month as you develop. Manage and secure every login – across multiple sites and platforms – with LastPass. LastPass remembers all your passwords, making it easier and safer for you to get on with your work each day. Simply install the extension in your browser, then make one strong master password. You’ll use this password to log in to LastPass each day, then LastPass will do the rest. It’s quick tricks like this that lead to a smarter approach overall. Keep adding in these little hacks and you’ll increase productivity substantially over time. Price: Start free. Maximum upgrade $4 per month/user. Buffer is the best social media management tool I’ve tried. I use it weekly and recommend it to all my clients. It makes scheduling posts (both original and curated) and tracking the performance of your content easy. If you’re a freelancer or small business owner managing your social feeds single-handedly, I’d recommend blocking out a couple of hours per week for planning and scheduling your content. By working in this way, you can ensure that you have posts going out consistently, even when you’re otherwise engaged. And, if you’re working on increasing productivity in other areas, automating this aspect of your marketing can save you heaps of time. Also, when you can work on a batch of content in one go – rather than creating one post at a time – you should find it easier to come up with creative ideas that fall in line with your brand’s voice and key messages. You should always monitor your social media profiles regularly. But, with your content already taken care of, you can switch your focus to increasing engagement and building real relationships with your followers. Price: Start free with plenty of features. Upgrade to the Awesome plan for only $10 per month to add additional profiles and schedule further in advance. The dreaded accounting. There aren’t many of us who enjoy it, but most of us just have to grin and bear it, especially in the beginning when paying an accountant is an expense we can do without. Wave is the free financial software that lets small businesses track their expenses, send invoices, manage their accounts, and get paid (hopefully on time!). Scan in or email your receipts, create professional-looking branded invoices and link your UK bank account for fast, smooth transactions. Perfect for freelancers and small business owners, Wave is an all-in-one solution to managing your finances in a quick, hassle-free way. I use it myself and I regularly recommend it. Price: The software is 100% free to use. (Pay a small fee for each transaction if your payments go through the Wave system. Or just add your bank details to the invoice and ask your clients to arrange a free direct bank transfer). One of the biggest (and most complained about) time-sucking tasks is managing an inbox. Whether you’re forever failing to reach that elusive inbox zero or you’re just looking for a way to increase productivity by avoiding distractions, Boomerang for Gmail can help. In basic terms, Boomerang puts you in control of when you send and receive email messages. Schedule outgoing mail to be sent later and pause incoming mail to avoid being disturbed when you’re busy. I use Boomerang myself and it’s one of my favourite tools. In fact, I recently switched over to Gmail especially for it. Price: Start free with plenty of features. Upgrade to $4.99 per user/month for mobile access. Need help setting up smarter working practices that’ll help your business grow? Email me at sadie@sadiefinch.com or call me on 07468 567419 to find out how I can help.